Build mobile app in iOS and Android platform that will provide a list of shared-use or commercial kitchens in the city and allows filtering list by date and time. Kitchen details can be seen through customized view of calendar and hourly timings which indicates that which time slots are available to book and which are not. Kitchen can be reviewed by its price based on the selected time slots which allows user to see summary before booking. Kitchen should booked by user’s credit card. To get updated information of shared-use or commercial kitchens in the city we use only online app concept. For concurrent and fast backend, we choose Microsoft .Net for our web services and database. For customized view of calendar we used Flexi Calendar Library and to show hourly indication per day we used Custom View for getting friendly UI. To notify booking status we had integrated Google GCM Service. We had used BrainTree third party integration for easy and simple payment process using credit cards. The app is ready to run on both platforms i.e. iOS and Android. User can easily search available kitchens with price rate and timings. 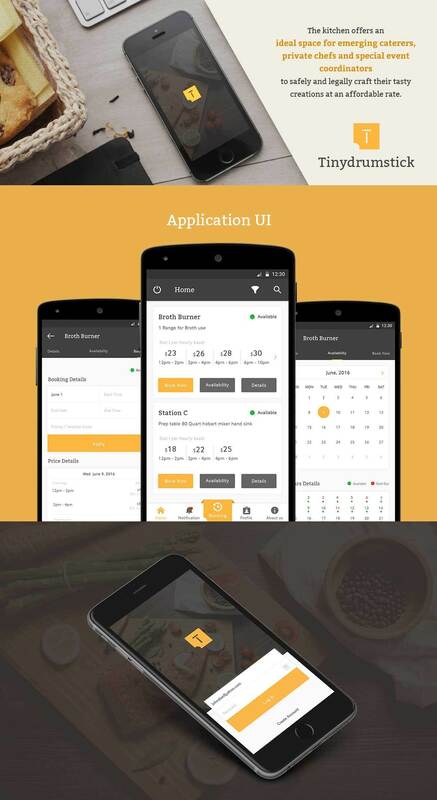 User can book available kitchen using this application.